The only thing better than visiting Las Vegas is grabbing some awesome swag to take back and show off to all of your friends. There are plenty of places throughout Sin City to pick up some cool souvenirs and keepsakes, but some destinations are just a little bit cooler than others. If you’re in the market for some music-themed memorabilia, we’ve got a place in mind that you won’t want to miss. Maybe something a little more edible? If so, Las Vegas has you covered with some truly unique items that you won’t find anywhere else. If you’re not quite sure what you want, there’s a diversified shopping destination you’ll need to see to believe. 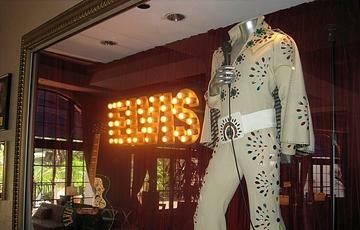 Now that we’ve got your attention, let’s take a closer look at the top three places to buy Las Vegas memorabilia. When you need a quick break from gambling, the Hard Rock provides a solution with a host of iconic Las Vegas memorabilia in the same building as its gaming floor. The Hard Rock logo is world-famous, and it stands as the focus on a variety of items ranging from tee shirts to shot glasses. If you’re looking for something a little most special, keep an eye out for their collection of rock-and-roll themed items, which may include autographed photos of your favorite bands or signed guitars. You really can’t go wrong at this shop. If you love M&M’s, there’s no better place on Earth for you to visit than Las Vegas M&M’s World. Here, you’ll enjoy four floors of candy-themed memorabilia, souvenirs and gifts, but don’t forget about the candy. This shop offers unique variations of the classic M&M’s formula that aren’t available anywhere else. Whether you want a special candy color or a new flavor, the floor-to-ceiling tubes of chocolaty goodness are just the thing to satisfy your cravings. Few places in Sin City address a sweet tooth better than this enormous candy collection. If you want to buy something but you aren’t sure what it is, this shopping center is the perfect place to start. Located right in the heart of the Strip, Miracle Mile Shops features 1.2 miles of unique shops, restaurants and live entertainment options to satisfy your urge to shop. With more than 200 of the world’s most recognizable brands, this shopping gem is the perfect retreat when you’re ready to take a break from the casino fun. If you’re not careful, you could spend your entire visit to Las Vegas browsing this expansive shopping destination. Now that you know where to start, you’re ready to get all of the Las Vegas memorabilia you could ever want. All of these spots offer great items that are tough to find outside of Las Vegas. While these three destinations stand out, it’s important to note that they are just the tip of the iceberg when it comes to Sin City shopping options. Take a stroll around the Strip, and you could find just what you’ve been looking for in no time flat. And since you’re already here, can we tempt you with a quick game? At Silver Oak Casino we have over 100 casino games for you to chose and not only have a blast, but also win big and boost your bankroll.